BARSS, JOSEPH, ship’s captain, privateer, and businessman; b. 21 Feb. 1776 in Liverpool, N.S., second of 14 children of Joseph Barss and Elizabeth Crowell; d. 3 Aug. 1824 near Kentville, N.S. 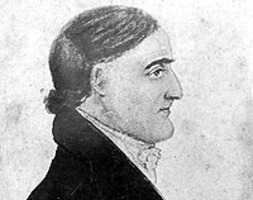 Joseph Barss’s father had been brought from New England to the pioneer settlement at Liverpool as a boy, and established himself as one of the township’s leaders and its representative in the House of Assembly. Joseph was at sea by the age of 14 as a member of his father’s salmon-fishing crew on the Labrador coast. By 1797 he was master on one of his father’s vessels; the next year he was second lieutenant aboard a large privateer, the Charles Mary Wentworth; and in October 1799 he was given command of a smaller one, the Lord Spencer. After one prize had been sent back from the West Indies, three of the Lord Spencer’s crew were injured in a brush with French privateers, and the vessel later ran afoul of a “Reaf of Rocks,” the crew having to be rescued by a friendly privateer. Barss then cruised in a prize, with no recorded success. January 1801 saw him sailing from Liverpool as master of the privateer Rover. He found little prey abroad (peace was rumoured), but sent home three prizes before returning in May. Privateering did not become lucrative again until the War of 1812, and so between 1801 and 1812 Barss sailed vessels in the Maritimes and New England coasting trade, including the Eliza, which he purchased from Simeon Perkins*. From July 1803 until March 1804 he and his sloop were in the West Indies, probably in government service and reportedly earning 1,500 dollars a month. Barss had marriage on his mind. He returned to Liverpool on 24 March, and on 12 April a bond was issued for his marriage to Olivia DeWolf, daughter of Elisha DeWolf, a prominent inhabitant of Horton Township. The couple settled in Liverpool, and Barss continued in the coastal trade, buying and selling for himself as well as others. He was also a member of a local group of underwriters which insured Liverpool vessels and cargoes. On 28 June 1812 news of the war with the United States arrived in Liverpool by the Liverpool Packet from Halifax. This small, fast schooner, originally built for the African slave trade, had been bought by Enos Collins*, with three other Liverpool men, including Barss’s brothers John* and James, as shareholders. Prior to the war she had been placed on the packet run between Halifax and Liverpool. By 22 August Lieutenant Governor Sir John Coape Sherbrooke had granted authorization to “apprehend seize and take any Ship vessel or goods belonging to the said United States,” even though he had not received any orders from Britain in this regard. In early September the Liverpool Packet was at sea, with Joseph Barss second in command. During her first voyage the command changed from John Freeman to Barss, probably because of a need for effective discipline, and he remained in control on subsequent cruises. When in November Sherbrooke received an order-in-council allowing the seizure of American vessels, privateers headed for the American coast, and Barss’s skill and the Liverpool Packet’s speed made him the leader of the pack. He concentrated his attacks around the approaches to Boston, particularly in the vicinity of the northern shore of Cape Cod, and his name became well known in New England ports, a high reward being offered for his capture. Thirty-three prizes taken under his command were disposed of before the Vice-Admiralty Court in Halifax. Although he boarded many more than that number, some were not worth sending back, some were protected by British safe-conduct passes, some that he did send back were lost in storms, and some were recaptured by American privateers. On 11 June 1813 Barss found himself engaged with a heavily armed American privateer, the Thomas from Portsmouth, N.H., and was forced to surrender. Although the crew was soon returned to Nova Scotia in an exchange of prisoners, Barss was kept in Portsmouth in close confinement. Influential friends such as Collins and his business partner Joseph Allison petitioned Sherbrooke to intercede on his behalf, but Barss was not allowed to return home for many months, and then only on parole. Nevertheless, in 1814 he took the Wolverine (the former Thomas, captured in 1813) to the West Indies as an armed trader, returning to Liverpool on 20 August. According to a Boston newspaper account of 28 October reprinted in the Acadian Recorder of Halifax on 12 November, Barss had been recaptured, having “broke his parole sometime since,” and had been imprisoned again. If so, he was back in Liverpool by March 1815, his health possibly injured through imprisonment and his seafaring life at an end. The earnings of the Liverpool Packet in 1812 for 18 vessels were £21,814, of which Barss probably received £1,000. In 1817 Barss bought a farm near Kentville, close to his wife’s relatives and away from the sea. There he lived with his still increasing family (there were nine children in all) until his death at the comparatively early age of 48. Liverpool, N.S., Simeon Perkins, diaries (transcripts at PANS). PANS, MG 1, 819, no.1; 825; MG 4, 77 (typescript). C. H. J. Snider, Under the red jack: privateers of the Maritime provinces of Canada in the War of 1812 (Toronto, [1927? ]), 17–52. T. H. Raddall, “Joseph Barss, Jr. – a famous privateer captain,” Liverpool Advance, 26 July 1972: 3. Catherine Pross, “BARSS, JOSEPH,” in Dictionary of Canadian Biography, vol. 6, University of Toronto/Université Laval, 2003–, accessed April 24, 2019, http://www.biographi.ca/en/bio/barss_joseph_6E.html.